Why does my cat carry her toys around? 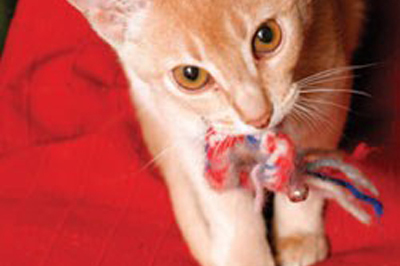 Some female cats will keep collections of toys that they regularly move around as if shifting a litter of kittens. (Q) Why does my cat carry a toy around while miaowing loudly? (A) Behaviourist Jon Bowen says: There can be a couple of explanations of this kind of behaviour. What we have to understand is that pet cats are behaviourally almost indistinguishable from their wild counterparts, but living in a domestic setting can distort normal wild behaviours so that they seem odd and out of place. The two situations in which cats carry things around are when they are hunting and when they are moving kittens from one place to another. In the wild, when cats catch prey they either take it back to a part of their core territory to eat it, or they find somewhere to hide it. Typically this means hiding the dead prey under dried leaves or sandy soil so that it becomes desiccated instead of rotting. Although cats much prefer to eat freshly killed prey, they will turn to these temporary stores of mummified food when they are hungry.